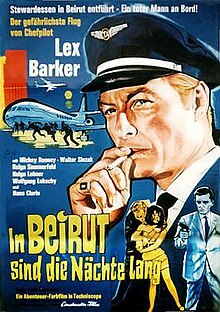 24 Hours to Kill / In Beirut sind die Nächte lang is a 1965 British/German international co-production drama film shot in Techniscope and Technicolor that was filmed in the Lebanon, then a tax haven. It was produced by Harry Alan Towers, directed by Peter Bezencenet and stars Lex Barker, Mickey Rooney and Walter Slezak. The film was written by Peter Yeldham who travelled to Beirut to research the film's plot. This article about a 1960s thriller film is a stub. You can help Wikipedia by expanding it. This article related to a British film of the 1960s is a stub. You can help Wikipedia by expanding it.